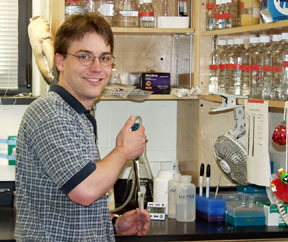 My research is focused on the role of the spindle pole in chromosome movement during mitosis. In a normal mammalian mitosis, chromosomes move toward and away from the spindle pole until they congress to the metaphase plate, at which point they oscillate at the equator until anaphase. We have found that disruption of the spindle pole by microinjection of antibodies specific to the mitotic motor HSET and the structural protein NUMA results in a severe suppression of chromosome movement (Gordon, et al., J. Cell Biol. 152: 425-434). Furthermore, spindle pole disruption activates a checkpoint preventing the cells from exiting mitosis. 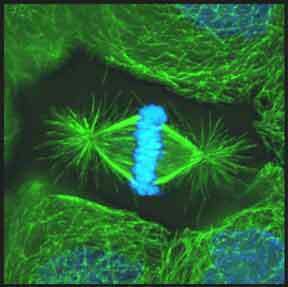 Mitotic spindle in a human CFPAC-1 cell at metaphase. 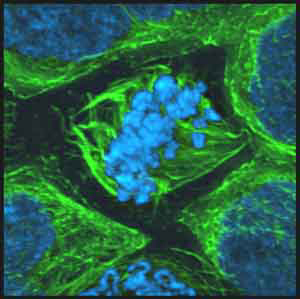 The minus ends of the microtubules (green) converge into a focused spindle pole, while the chromosomes (blue) align at the spindle equator. 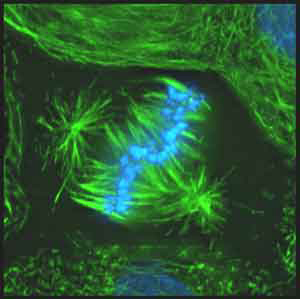 Mitotic spindle in a human CFPAC-1 cell following injection with NuMA antibodies. Upon microinjection of NuMA-specific antibodies, spindle pole formation is disrupted yet there remain local regions of microtubule focusing (microtubules = green, chromosomes = blue). Mitotic spindle in a human CFPAC-1 cell following injection with HSET and NuMA antibodies. Spindle poles are completely disrupted upon microinjection of both HSET-specific and NuMA-specific antibodies. Under these conditions, chromosome movement is severely suppressed (microtubules = green, chromosomes = blue).